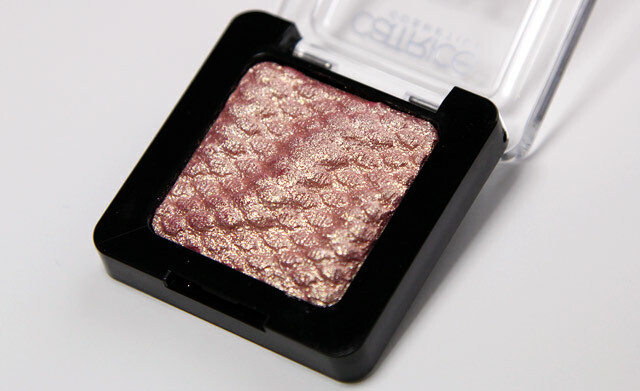 In this Bargain Beauty I’d like to share some more Catrice yummyness. I already showed you Catrice’s Made to Stay Inside Eye Highlighter Pen a couple of days ago, but recently I found some other gems. 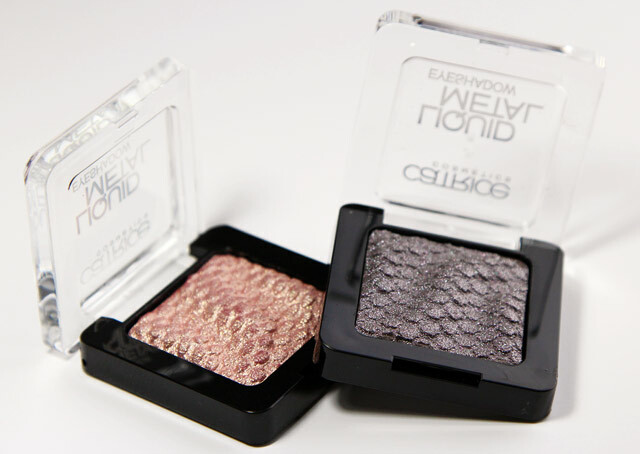 Catrice recently launched nine new Liquid Metal Eyeshadows and I have two to show you today. 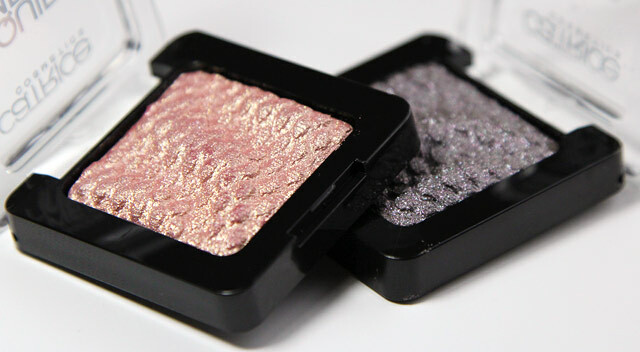 M.A.C Extra Dimension Eyeshadows watch your step, because Catrice is coming for you.. 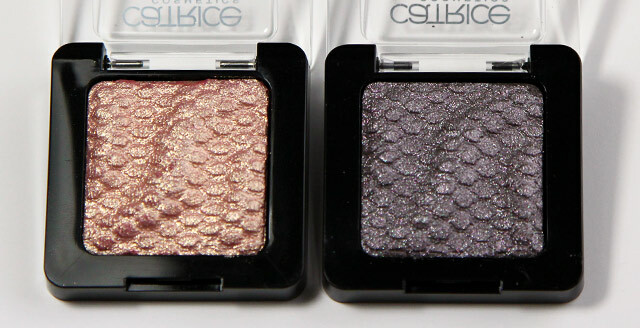 The Catrice Liquid Metal Eyeshadows come in a shiny, plastic Black case with Clear top. 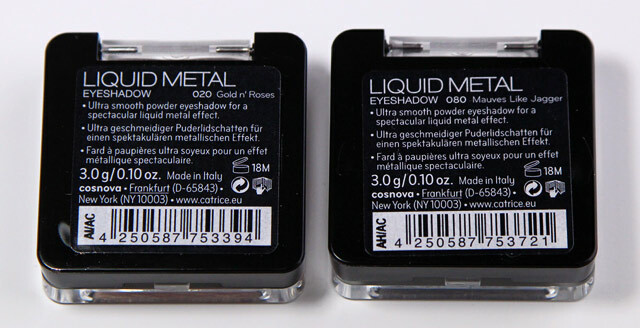 On the bottom you find the eyeshadow’s name and other necessary info. There isn’t really anything you can hate on here. I think the packaging is smart and simple. Catrice chose to not let their packaging do the work, but the actual product. The plastic is very sturdy, but still, it’s plastic. I wouldn’t want to drop this. “Gold n’ Roses” is what I would describe as a pale, soft Pink base with a Light Gold & Champagne shimmery shine. 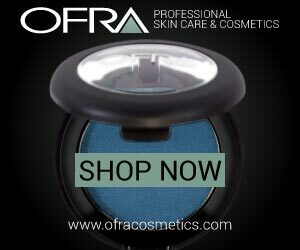 It’s beautiful for inner corner highlighting or a luxurious shiny color on the lid. 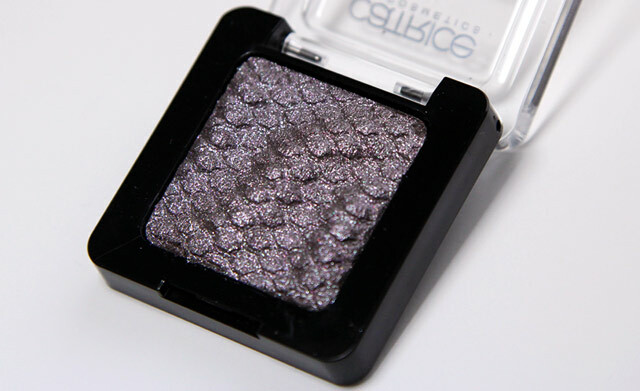 – “Mauves like Jagger” is a Grey/Gunmetal base infused with a Lavender & Silver shine. This is a cool-toned smokey eye must + I love the name! As I said, Catrice chose to let the product do the talking, not the packaging. And boy, did they do good on these. The Liquid Metal eyeshadows have a beautiful embossed pattern that shows off the multi-dimensional shimmers and reflects perfectly. Of course this is totally inspired by M.A.C’s Extra Dimension line. I absolutely love these shadows. They’re a shiny, metal heaven. Where I feel like most drugstore brand eyeshadows crumble and spill a lot of product, these are a whole new level. They do crumble more than the M.A.C Extra Dimension range though. 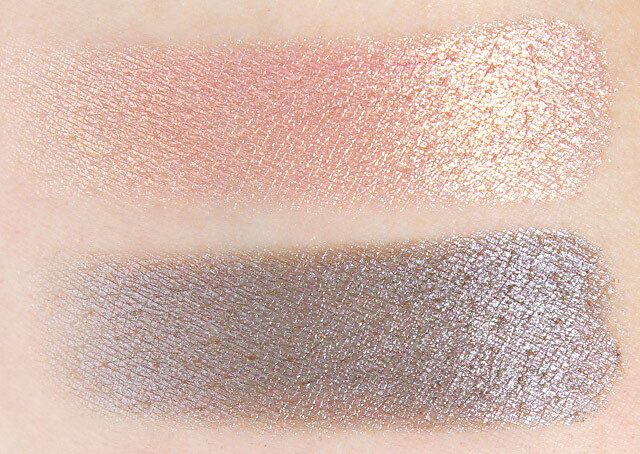 The eyeshadows are pigmented, soft and stunning. You only need a little bit, and you’re good to go! I do recommend a primer with these, as they aren’t very long lasting. I think these are a great budget-friendly cousin of the M.A.C Extra Dimension range. Of course if you lay them side by side, I have to admit that M.A.C is the overall winner, but these are definitely worth considering. The Liquid Metals are great in texture and pigmentation but their lasting power isn’t one for the books. But it’s nothing a little bit of primer can’t fix! 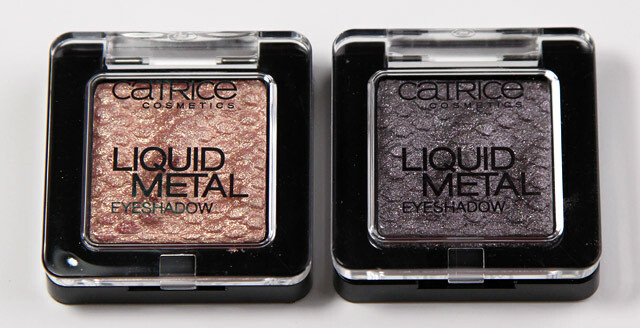 Catrice Liquid Metal Eyeshadows retail for €3,99 each and are available at Kruidvat & Trekpleister (Dutch). Amsterdam Haul: MAC, Estée Lauder & More + NEW HAIR! This entry was posted in Bargain Beauty, Makeup, Reviews, Swatches. Bookmark the permalink. Anyway, it’s nice to see that there are really affordable products that have amazing quality. When applied wet, they do last a lot longer and have waaaaaaaaaay more intensivity. Nikkie ik vind je echt geweldig. Je bent de allerleukste blogger/guru op internet!!!! Wat houd ik toch van Catrice :). Ook dit ziet er weer top uit! Ik heb de paarse maar ik vind deze kleuren ook erg mooi! Ik heb ze ook, prachtig! Die rozige kleur is echt heel mooi! Aww, heb nog staan twijfelen aan het Catrice-schap en nu heb ik spijt dat ik ze niet meenam! My purse is not so thankful right but I am. :D After the other post I run to the nearest drugstore and bought the Catrice pencil. I saw these eyeshadows too but I thought they not that nice. Now, after you post I found them much more nicer. I have to get them. They’re beautiful. Ik heb ze al een maandje, dus ze zijn er al even..maar ze zijn echt prachtig! 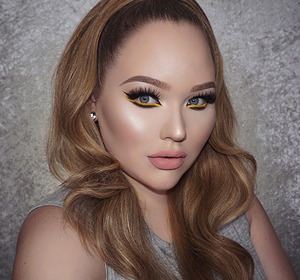 Smoky eyes made with the darker one is so cool for the daylu look! I bought these eye shadows after your post (and later even more shades) but I don’t think you’ve ever used in these in a video?